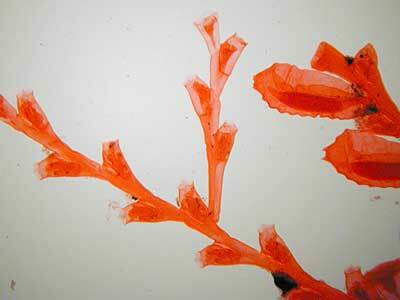 Description: The main stems and side branches are thin, wavy, and of a bright yellow colour. The main stem branches irregularly. The side branghes support alternate hydrothecae, one to each internode. The hydrothecae are bulbous at the base and become narrower towards the rim. The rim has four cusps, and an operculum that consists of four triangular flaps. The gonothecae are generally ovate in shape and rugose in texture. A raised tubular structure with four vertically projecting denticles, surrounds the aperture. Although the male and female are similar in shape the male is considerably smaller and is white, whilst the female is yellow in colour. Colonies typically 40-50mm in height. 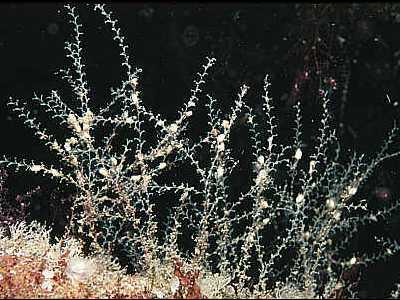 Habitat: This hydroid often grows attaced to shells or algae, usually in considerable water movement. Distribution: This species is common throughout the British Isles. Similar Species: Several species of Sertularella could be confused with this species. Hydrothecae borne alternately on main and side branches. Rather loose and irregular branching. Picton, B.E. & Morrow, C.C. (2016). Sertularella polyzonias (Linnaeus, 1758). [In] Encyclopedia of Marine Life of Britain and Ireland.